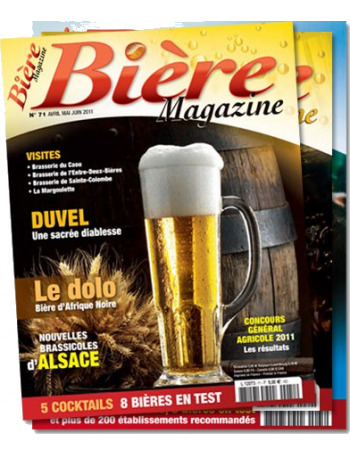 1 year subscription to Bière Magazine: for all beer lovers! Four issues of the magazine dedicated to beer and breweries. Un magazine dont j'attends chaque numéro avec impatience ! Le magazine n'a pas été livré avec le verre. J'espère que la personne va recevoir le prochain magazine à son domicile. Receive at home, every three months, a new Bière Magazine edition. It brings up news about beer and breweries, reports, stories, recipes, cocktails and more. Shipping costs are included in the price so enjoy this opportunity now! Bière Magazine is edited every three months. When ordering it, you will receive the magazine of the following period, never the one in course. - January, February and March: You will receive the magazine of the 2nd quarter, being April, May and June. - April, May and June: You will receive the magazine of the 3rd quarter, being July, August and September. - July, August and September: You will receive the magazine of the last quarter, being October, November and December. - October, November and December: You will receive the magazine of the first quarter of the following year, being January, February and March.